I know I'm supposed to update this blog, but I've gotta admit, I've been a little distracted lately. See, Ol' Doc Atomic is engaged. And I don't mean, "I'm engaged in the act of collecting toys." (Even though I always am!) No, I mean engaged engaged. Like, you know, to get married. So I've been a little less focused than usual, and the blog, well, it's suffering for it. But give me a couple more days to get my head together and I promise I'll start posting regularly. I've got a pile of toys just itching to be written about, I've got another "Captain Conner's Corner" article about saucers that I've been sitting on for months, I've got two amazing interviews that are begging to see the light of day -- really good stuff! Rest assured, this blog has not been orphaned! But you'll understand if I've got a few other things on my mind! And now a question, because I could really use some advice: How do I convince my completely awesome future wife that using toy robots as invite themes, table decorations, and a cake topper will not make our wedding look like a science fiction fan's bar mitzvah? Of all the toys posted here in the Attic, which is your favorite so far? And if that's too difficult, how about giving me your top three? No particular reason, I'm just curious. If you're so inclined, stick your answers in the comment section. 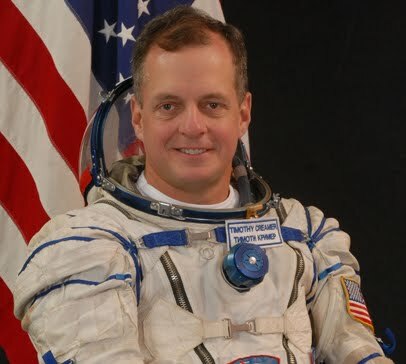 I recently travelled down to NASA headquarters in Washington, D.C., to film a presentation by astronaut and U.S. Army Col. Timothy "T.J." Creamer. He was discussing his days onboard the International Space Station with an audience of about 40 people, all of whom follow his tweets from space. My shoot was for a piece being produced for a web site called Rocketboom. The entire talk was fascinating, but my ears really perked up when he took a moment to discuss science fiction. Consider it: A real, live astronaut. Talking about science fiction. I'm amazed my head didn't explode. Since the bite never made it into the final Rocketboom piece, I got permission to post it here in the Attic. If you'd like to see it in glorious HD, click through to the YouTube page and select the highest resolution. You know, I've interviewed a lot of famous people, a lot of powerful people, a lot of downright interesting people. And after all this time, I've really learned to keep my cool and remain professional whatever the situation. But standing in front of an astronaut -- and a really friendly, cool one, at that -- was pretty amazing, and I'm not embarrassed to admit that I came real close to becoming a blubbering fanboy. I held it together, but when we walked out of the shoot, I couldn't stop grinning and I'm pretty sure my correspondent was sick of me muttering under my breath, "So cool... so freakin' cool!" You can check out the Rocketboom piece, which includes a short, but exclusive interview with Colonel Creamer, at rocketboom.com. NASA broadcasted the entirety of the presentation live on their web site; I'm sure it's still archived there. Find it at NASA.gov.